Times are tough. There’s a shortage of great candidates, and political uncertainty is causing delayed decision-making across business. What does this mean for your travel business if you’re looking to expand or at least keep recruiting successfully? Our advice is that it’s time to change your attitude towards recruitment. It’s hard to ignore that homeworking is increasing, and employees are demanding a more satisfying work-life balance. So, if you’re just offering the same-old 9-5 in the same-old office spaces, you may not be attractive to great candidates. Time to start recruiting creatively. Travelodge reported last week that it’s opening 100 new hotels, and creating 3,000 jobs by 2023. In 2012, the company was on the edge of collapse, but having changed its attitude, is now on the up. With a reported quarter of all hospitality jobs being done by EU27 nationals, it recognised that Brexit uncertainty meant creative recruitment was needed. Travelodge is deliberately targeting parents who require flexible working-hours in its more creative recruitment strategy, knowing that there will probably be less EU migration in the coming years. This is a positive move by Travelodge. Those who are bringing up children and restricted in the times that they can work due to school and nursery pickups are often seen as a poor choice for business. But we disagree; we think recruiting creatively means hiring just these people, and being more flexible. We think it’s a great idea. Whatever you think of Brexit, it’s certainly a wake-up call for the travel industry to review recruitment strategy. We can no longer make assumptions that we will have an endless supply of travel talent. Yes, we need to keep a close eye on immigration rules, and how this will affect multinational travel businesses, particularly those who rely on EU migrants. We don’t want to spread fear or misinformation, but it makes sense to encourage clients to broaden their recruitment outlook. There is a misconception that EU nationals tend to take junior and unskilled roles in the travel industry, but they actually do all sorts of travel industry jobs at every level. Clearly their language skills are often a massive asset. Even if some EU nationals continue to be able to work here, there will be an inevitable decline in numbers simply due to current uncertainty. So, businesses need to start recruiting creatively. What does that mean in practise? We suggest that companies use insights to make informed decisions when it comes to a bold new recruitment strategy. Could you offer more flexibility in job-sharing or part-time work? Do your employees have to start at 9, or would 10 actually be acceptable? Could more staff work just during school hours? Could people work one or two days from home? We can help provide relevant employment information for you to make informed decisions when developing your strategy. Contact me for more information about recruiting creatively. I’m a home worker – which is increasingly common in the travel industry. I work from home 21.5 hours per week and I basically pick and choose when I work. I feel incredibly grateful that I can do what I love and also get to spend plenty of time with my two young children. My husband does shift work so I cannot work set days per week. My days change every week. In return for that flexibility I do sometimes respond to correspondence outside my work hours. 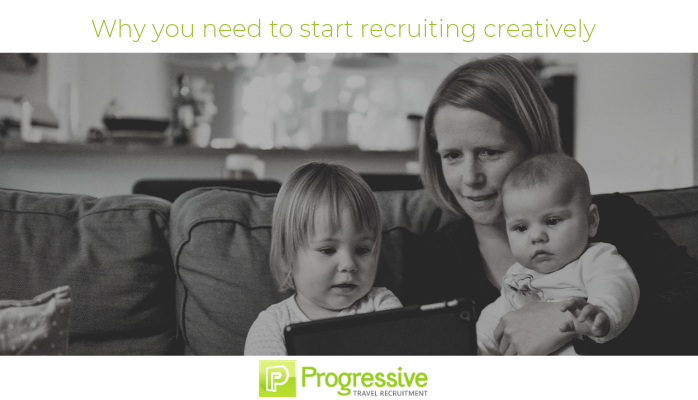 For most companies, this would be a logistical nightmare but I’m lucky that here at Progressive Travel Recruitment that James is flexible and understanding of working parents. Of course, homeworking needs discipline and boundaries so that work doesn’t continually bleed into family time. But it’s an enormous help to be able to work around family commitments. James Roberts, Progressive Travel Recruitment’s founding director, says, ‘I’m a big fan of not being stuck in a rut re recruitment. Most of the Progressive Travel Recruitment staff work from where they like. I’m also happy to hire someone with tattoos, and admire companies like B&Q who actively encourage mature workers, or Timpson who employ ex-prisoners. For me, these make me respect their company ethos more.’ Read this LinkedIn Article about ‘Hiring Someone Different’, which James wrote on the subject. Of course, it’s not unusual to hire parents, but unfortunately it is still rare for employers to offer flexible working arrangements for parents. This is a large untapped resource in my opinion, and requires a shift in thought for companies to start using it. But in the longterm, they will benefit. We do already suggest to clients that they should think more creatively about hiring, but this tends to be when they’re struggling to fill a vacancy. At that point we may suggest they could consider a job-share or homeworker. However, clients need to think about being flexible as a first resort rather than a last resort. There are plenty of talented people out there who just can’t fit into the restrictive boxes that so many employers create. It also feels good to give people a chance who don’t fit into those boxes. If you do, it may give them the opportunity to climb the travel career ladder. When their children are older these parents can spend longer hours working. It’s an investment that’s worth making.